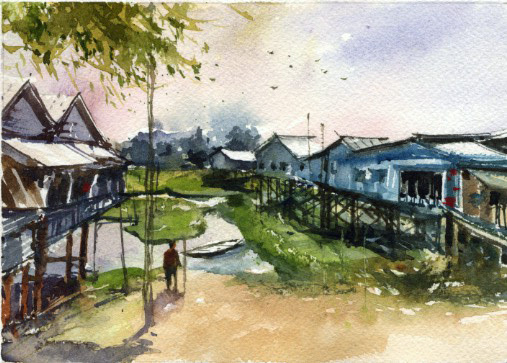 Every month I enjoy participating in Bill Guffey's Virtual Paintout. Bill chooses participant's location to paint from places the Google Street View vehicles have covered. 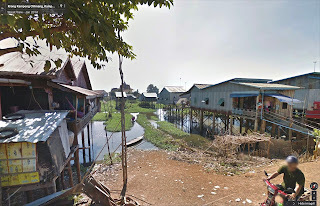 For July it was Cambodia in Southeast Asia. As always it was interesting to look around as much as I had time to do. I was surprised that Angkor Wat (a World Heritage Site) and other ancient temple sites and complexes were thoroughly covered by Street View. Golden pagodas seem to be everywhere but so does widespread poverty. 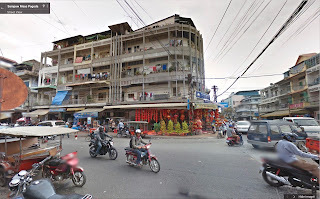 Hopefully Cambodia continues to grow and its problems improve. I almost forgot about this gouache piece I painted in May. 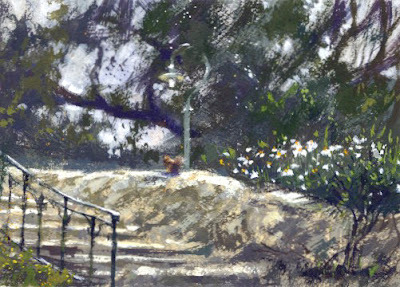 The Saturday paint-out group met at Garfield Park in South Pasadena. My previous blog post of the park was two years ago, Summer in the Park. It was one of our Southern California "May gray" days, a little chilly, overcast, no shadows. It's a big park, but oddly, the painters that day all chose to paint the view of a charming street bordering the park...Park Avenue. As I painted I was entertained by several cats engrossed in their morning cat activities. Always a fun morning painting with friends. 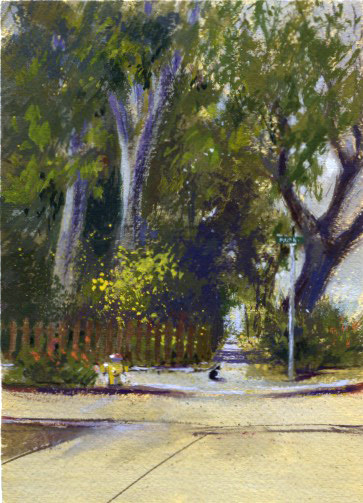 In May our Saturday paint-out group revisited La Casita Del Arroyo in Pasadena. 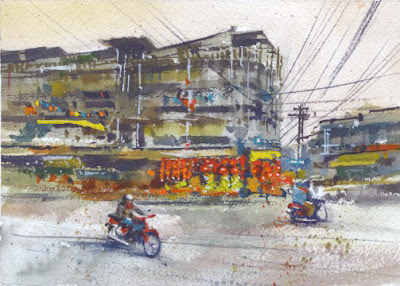 It was last November when I last painted there and posted my watercolor, Another Casita Autumn. There was a lot of activity around La Casita, setting up for a wedding. Guests arriving! I needed to paint quickly and get out of their way. So on this visit I looked for something of interest besides the building. There were beautiful Matilija poppies blooming and a gorgeous rambling rose. From the parking lot there is a great view of the famous Colorado Street Bridge. I tried to be out of the way of the wedding preparations and went down the side stairs to paint my gouache piece. So many nice areas and views to paint there. And I'll be returning in a few weeks! 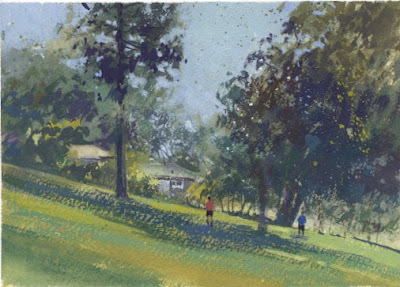 Last Friday I painted at Descanso Gardens in La Canada Flintridge. 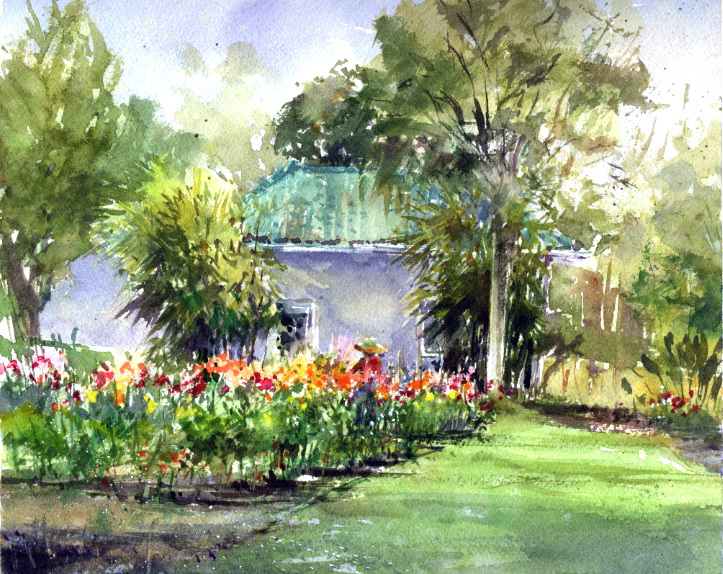 It's a botanical garden of over 150 acres so there is always a great choice of views to paint. Maybe there are too many choices and not enough painting time! I tend to walk around looking for too long. On my previous paint-out there I painted The Crow. Near the entrance is the Descanso Gardens Enchanted Railroad that I have never painted. The eighth scale diesel replica has its own train house. So this time I sat across the promenade and tried a watercolor of the train house and flower beds. Descanso also features a lot of power lines, towers, and poles that I'm always happy to include! 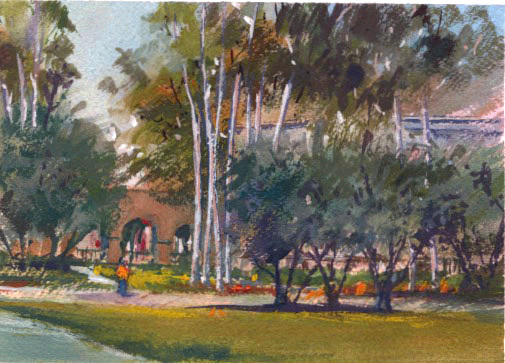 It's been a few months since I painted this watercolor at the Wrigley Mansion in Pasadena. Since 1958 it's been the headquarters for the Tournament of Roses which organizes the New Year's Day Rose Parade. Of course the extensive and lovely rose garden there usually features many beautiful flowers. Our paint-out day started out a little overcast. On my previous paint-out there, I painted the rose garden in, November Roses. The rose garden was my subject again and my painting has been a dilemma. Maybe it was the dreary mood of the day's start, or too much green? I might have liked a different approach more. Next time! We had another beautiful Saturday paint-out at CalTech. It was just a couple months ago that I painted a watercolor, Pink at CalTech. On this visit I wanted to try a gouache piece while the gouache workshop I took from Mike Hernandez was still on my mind. Hopefully some of what I learned will eventually make it to my brushes. I had a grand view across a lawn to a walkway with arches in the distance. The trees at the campus are so beautiful I couldn't resist including some olive trees as well as a few of the many eucalyptus trees. The eucalyptus are spectacular with their height and white trunks. As always I'm looking forward to our next visit. 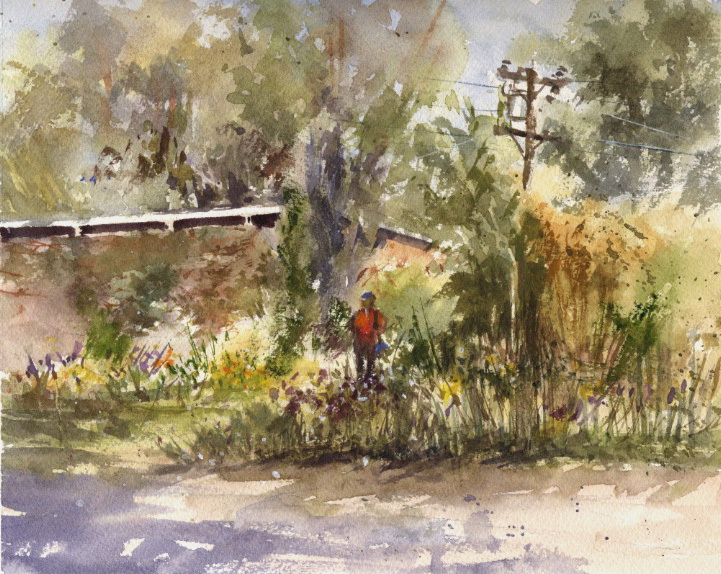 Last year for July 4th weekend we painted at Farnsworth Park in Altadena. I tried to capture the Little League tournament that was going on that Saturday in Tournament for the 4th!. Yesterday the group returned to the park and another Little League tournament day. For this painting, I looked a little to the left of the baseball field, across the park, and across the street. I also added two boys playing some catch. I thought the expansive lawn and great trees would be good practice to remember some of what I learned in the Mike Hernandez gouache workshop. It takes awhile of painting for new tips to possibly replace any old habits. Another fun morning painting with friends. Happy July 4th!